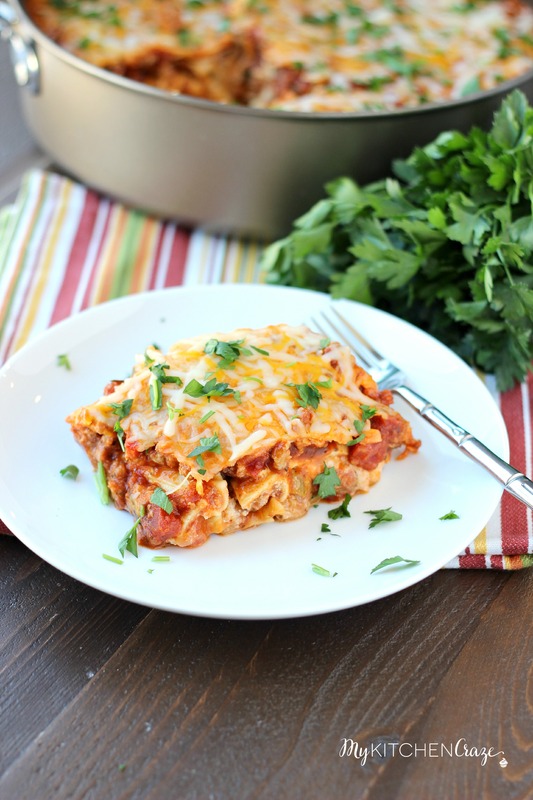 Simple Skillet Lasagna is an easy meal that will be on your table in no time at all. No more store-bought lasagna for you. 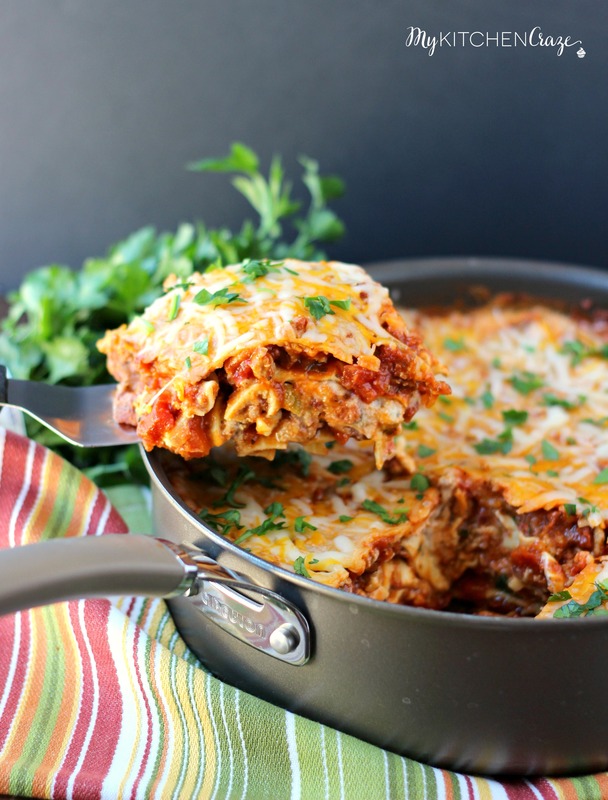 Have a delicious skillet lasagna in minutes. Yum! Happy Monday friends. Today I’m sharing an easy and delicious recipe with you all. When I was in my 20’s I used to buy boxed lasagna all the time. I loved it and that was my go to meal. In fact I think that’s all my hubby and I lived off of our first year of marriage. While I was shopping at Wal-Mart this past week, I noticed that Kraft Natural Cheeses came in a larger 1 pound size and I couldn’t resist buying some. I just love cheese. Who doesn’t? I really like Kraft’s Natural Cheese’s. I love that you can save time with the already pre-shredded packages. Plus they have a huge selection of favors. One of the many reasons I love Kraft Natural Cheeses is because they’re well balanced, nutritious, and made with fresh and natural ingredients. You’ll love them! I use them in all sorts of recipes. Anywhere from tacos, quesadillas, omelets and pasta dishes. I knew once I bought these cheese packages that I needed to make my skillet lasagna. I came by this recipe on accident actually. It’s one of my aunt’s recipes she gave me a while ago. So I tweaked it a little here and there and wha-la. 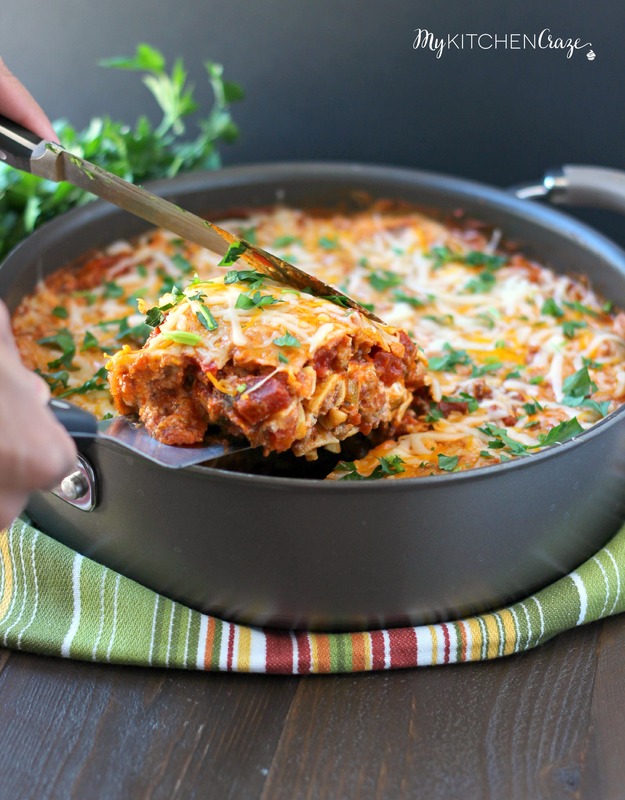 This Simple Skillet Lasagna was born. I’ve made this recipe for parties, work functions for the hubby and at home. Every time I make this recipe, I always love how easy and quick it comes together. 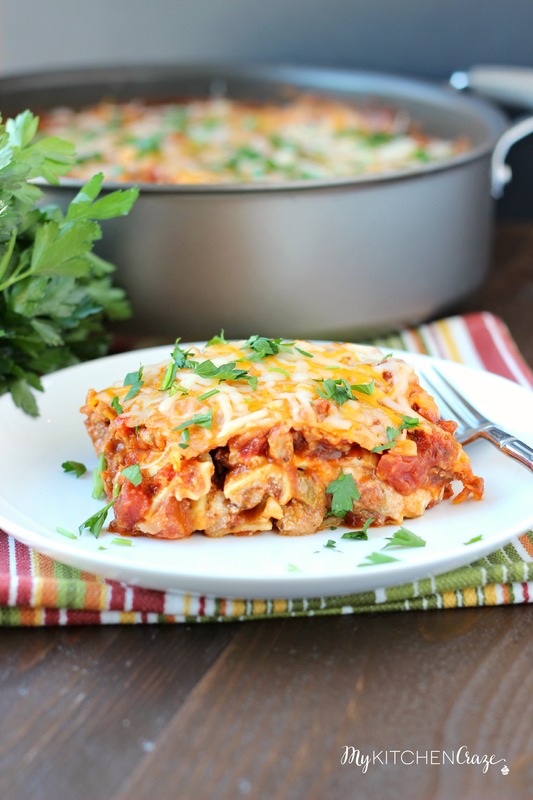 You all know that I’m all about easy and quick meals in our home and this simple skillet lasagna takes minutes to whip up. 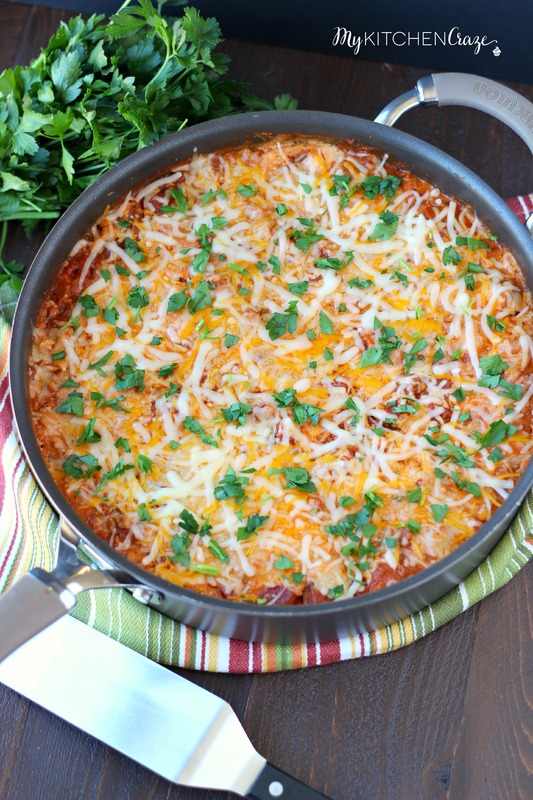 No matter if it’s a busy day, or you need a pretty meal for that next potluck you need to consider this Simple Skillet Lasagna. 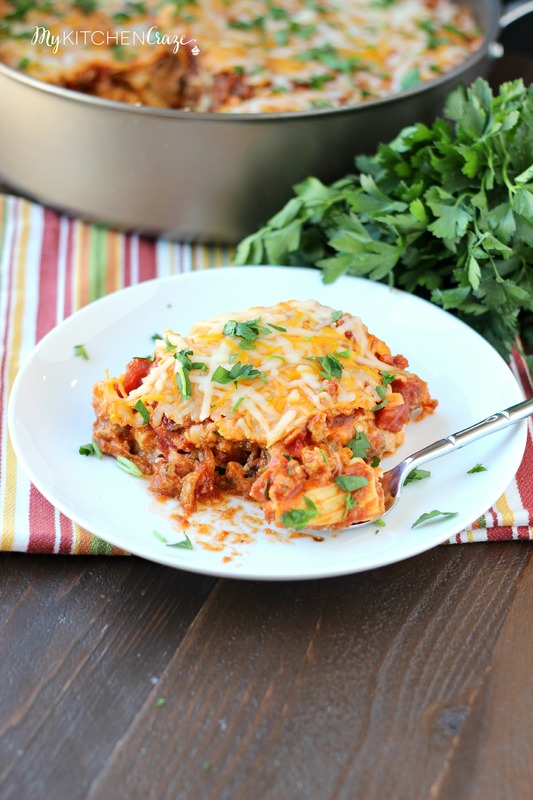 It’s rich in flavor and taste better than any store-bought lasagna, but with out the hassle. 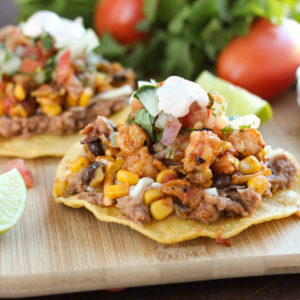 Make this for dinner and you’ll be the best cook ever! In a medium size bowl, add the cream of celery soup, eggs, ricotta cheese, 1/2 cup mozzarella cheese and Italian seasoning. Mix well. Using the same large skillet turn the heat on to low heat. Add in 1 cup of meat mixture and spread evenly over the bottom of the skillet. Layer with noodles, breaking them to fit. Layer with 1 cup ricotta cheese mixture, 1 1/2 cups meat sauce and noodles. Continue this process one more time ending with the noodles. Top with remaining meat sauce. If you’ve run low on meat sauce, this is where you can use of that extra spaghetti sauce. Turn heat up to medium-high heat and bring to a boil. Reduce the heat and cover. Simmer for 15-17 minutes or until noodles are tender. Remove the skillet from the heat and sprinkle with shredded cheeses. Cover and let stand 2-4 minutes or until melted. Garnish with parsley and basil. I’m totally craving this lasagna for breakfast, Cyndi! 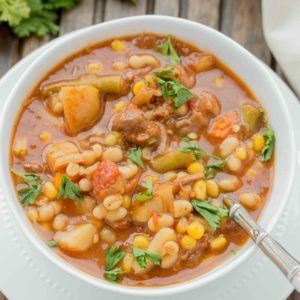 I love how easy this is to make, and even better that it’s in a skillet! 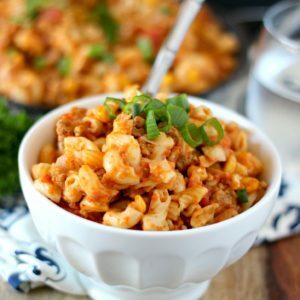 I wouldn’t be able to resist the cheesy, hearty ingredients. 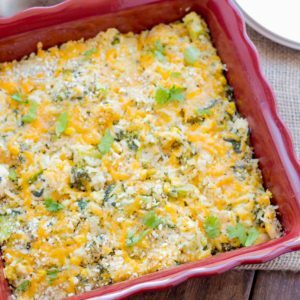 Sounds perfect for a weeknight meal! I love skillet dinners! This one looks fabulous! What a fantastic weeknight dinner. My kids never say no to lasagne (well, nobody in the house does 🙂 So nice to make it simple in the skillet!! What a great dish! I can’t believe how easy it is to put together, and better yet – almost no time to cook! That’s awesome for a fab lasagna dish! Great recipe that I can’t wait to try! I have been wanting to try a skillet lasagna for so long! This looks like the perfect recipe! I love this skillet idea – what a great idea and it looks fantastic! This is brilliant! I love lasagna! So easy and tasty as well, winner!! !